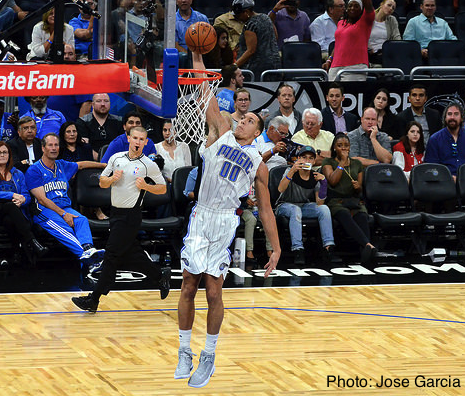 The Orlando Magic bring back promising 5th-year power forward Aaron Gordon to a four-year, $84M contract. Gordon enjoyed his best statistical season yet as a pro this past year, averaging career-highs in points (17.6), rebounds (7.9) and three-point shooting (33.6%). We caught up with Gordon one-on-one at his youth basketball camp in College Park, Orlando. You can click the "play button" below to listen to the interview, or scroll down to read the transcript. Baumann: David Baumann alongside Aaron Gordon for 407area.com and 96.9 The Game. We're at Aaron Gordon's basketball camp and I don't think I'm even going to have as tough as the questions the kids had at this camp. Aaron these kids can ask some tough questions too huh! Gordon: Oh man, solid man. They're always trying to get me to say something that's not politically correct. Baumann: Ha! That's the great thing about kids, they got no inhibitions. They want to know your favorite player. What did you give them? Magic Johnson, some of the guys you grew up watching. Gordon: Yeah, Michael Jordan, Magic Johnson, Larry Bird. I think if you could roll those three players into one you'd have the perfect player. Baumann: Well, we've got Aaron Gordon back in Orlando for another multiyear contract. How good does it feel to have that off your back, off your shoulders. This free agency period over with. Gordon: It's great man. I know it seems kind of counter intuitive, but now I can working off the court. As much as I'm going to work on the court, I can work off the court with the community, and start to do the things that I want to do. I want to enrich the community and leading the way that I know how. Baumann: One of the great things about Rich DeVos was his work in the community. This (youth camp) is just another fruit of his labor as well, right Aaron? What can you say about the passing of Rich DeVos this week? Gordon: It's sad man. It's a huge hit to this organization. He was always super encouraging. Always proud of us. He was one of my biggest fans. He had plenty of advice to share with the team. Plenty of antidotes. Hopefully we can get something going for him. Baumann: Speaking of getting something going... You've got a new Mo Bamba with you this year, the Magic rookie draft pick. Fans are excited about the new "Big 3" in Orlando. Are you? Gordon: Oh of course. It's going to take some time though. We gotta understand how to play with each other. It's still on the coaching staff how they're going to put us on the floor together and use our talent. But we got plenty of talent. Baumann: Just a few weeks away from camp too. It's crazy. Summer comes, it goes. You've had a lot going on. A new movie out (Uncle Drew). Man, this has been a busy summer right? Has it been a blur? Gordon: It always is. As much as the offseason for the NBA is like the greatest time in the world, it's not greater than "on"season in the NBA. So I'm excited to get back. Baumann: Yeah, alright. As we get going, you say it's going to take a little time. But tell us a little bit about yourself, Jonathan Isaac, Mo Bamba, Evan Fournier, what's being built here in Orlando. What do you envision? Baumann: And a new coaching staff! Gordon: And a new coaching staff. If we can stay even keeled and we can keep working with each other for everyone's benefit, it could be great. Baumann: Aaron, last before we let you go, these kids at this camp... Just how much of a treat was it for you to interact with these young'ins at the Community Center here in College Park? Gordon: It was great! I love doing camps like these, I'm going to do a ton more! Baumann: That's awesome. Aaron Gordon with us right here on 96.9 The Game. I'm David Baumann for 407area.com. A big thanks to Aaron Gordon!